Here we have Darren, one of our Porsche technicians, mating the 964 engine and gearbox together before being reinstalled. Mount into dedicated engine rebuild facility to strip and visually inspect the damaged parts. Disassemble engine down to bare casings in order to clean, weigh and measure precisely all components. Reassemble using new parts including: Pistons, Cylinders, Connecting rods and bearings, Camshafts, Bearing shells, Through bolts, Chain guides, Timing chain tensioner, Gaskets and relevant seals. Reinstall engine and gearbox back into the car. Extensive fine tuning and road testing is carried out before customer handover. Interested to know more about our capabilities? Click here or contact us to speak with an advisor. Hope to see you all next year and thanks for making this year's event so succesful! It's Turbo Tuesday at Precision Porsche! There's usually a couple of Turbo Porsches of some description in the workshop but 6 at one go is unusual! The 991 Turbo S is in for a detail and Ceramic Coating, the 997 Turbo S is in for a general check over and preparation prior to sale, the silver 996 Turbo S Cabriolet is in for a full Service and MOT, the green 993 RUF Turbo is in for Service and some Detailing, the yellow 964 Racecar is in for corner weights, a geo setup and other track required mods, whilst the white 930 Impact Bumper Turbo gets a major service, minor body repairs and its fuel system sorted. At Precision Porsche we love Porsches and we love Turbos. Check out our Fixed price Servicing Menu HERE and we look forward to seeing you soon. Our fixed price Servicing is guaranteed to make your Porsche Happy! Using the very latest Porsche diagnostic equipment we offer main dealer servicing on all Porsche models at more favourable rates than a main dealer. 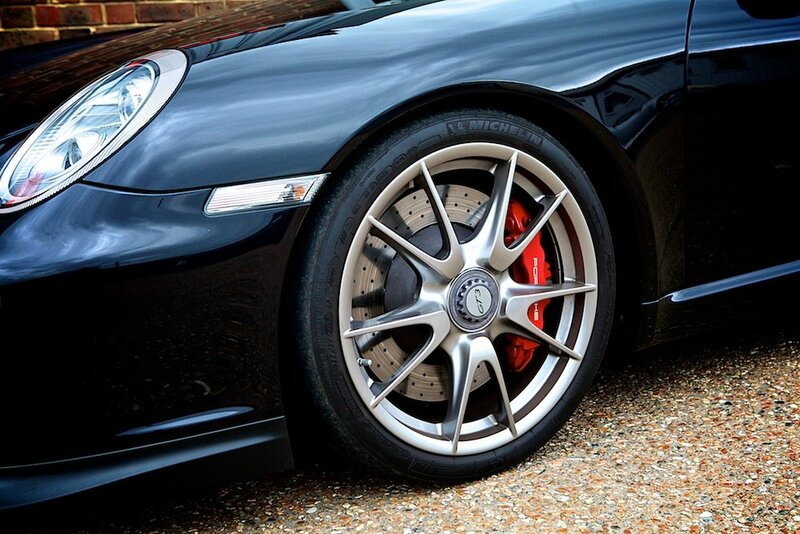 We also make sure any Porsche Warranties remain intact by using genuine Porsche parts. Click for Fixed Price Porsche Servicing on all Porsche models. Cars & Coffee 2018 - a date for your diary! Cars & Coffee 2017 was such a success, we’re doing it again this year! So please join us for our first Cars & Coffee meet of the year, on Saturday 7th of April at Precision Porsche. We guarantee lots of lovely Porsche's to feast your eyes on, like-minded Porsche owners to chat to and a chance to meet all of the Precision Team. And hopefully the sun will be shining! Coffee and refreshments will also be provided, so please drop us an email letting us know if you'd like to attend, so that we have an idea of numbers. We'll also be offering a limited number of Free Health Checks on the day, WHICH MUST BE BOOKED IN ADVANCE. Please call 01825 721205 to secure your slot. Cars and Coffee, Saturday 7th of April from 9.00am - 1.00pm here at Precision Porsche. Please call 01825 721205 to secure your place on the day. Advance bookings only please. Brake squeal is nothing to worry about, assures Porsche. The high-pitched noise sometimes emitted from brake pads and rotors that causes stress, and sometimes embarrassment is a completely normal occurrence, say Porsche. In an overly informative video explaining what brake squeal is, and why it happens, owners should rest easy knowing the noise occurs when energy and heat convert to vibrations. The brake rotor then acts as a "speaker" and amplifies the vibrations to create the squeal. In Porsche cars specifically, the large brake pads can create more squeal at low speeds due to pad pressure distribution. But, if an owner is concerned, a Precision Porsche technician can confirm the noise is nothing more than the parts operating in a normal fashion. So don't worry too much about the brake squeal. Instead, just enjoy the car no matter what obscure sounds it may make. Besides, a Porsche powertrain and its associated soundtrack should more than make up for occasional brake squeal. Many of our customers drive Porsche Panameras and Precision Porsche are happy to offer them Fixed price Servicing , ensuring their Porsche Warranty remains intact by only using genuine Porsche parts. The new 2018 Panamera is called the Sport Turismo. Four variants of the model will be available for 2018—4, 4 E-Hybrid, 4S, and Turbo. But if you’re in the Panamera game for ultimate speed, it’s the Panamera Turbo S E-Hybrid—only available in the original body style—you’ll want. Coupling the 550-hp twin-turbocharged V-8 with a 136-hp electric motor, Porsche’s magic math yields a combined output of 680 horsepower and 626 lb-ft of torque. Which is just about enough. Porsche is ready to show off the oldest 911 in its possession after three years of meticulous restoration: a 1964 901. Porsche purchased the rare car in 2014 after a German television show focused on finding old treasures stumbled upon the car during an episode. Upon its discovery, the team immediately contacted the Porsche Museum, which verified it was an incredibly rare car. The company paid an undisclosed amount for the 1964 901 after a professional appraised the car. Here at Precision we specialise in restoring and servicing all Porsches, although not all are as old as this one. Please call to discuss your Porsche project. Happy New year from all the team at Precision Porsche! 2018 will be busy for us with many new customers venturing into Porsche ownership and we look forward to welcoming them to Precision. There will be our popular 'Cars 'n Coffee' meet in the Spring, which will include free Porsche health-checks and a chance to meet the Precision team, so watch out for that. We also attend our local Porsche club 'meets' once a month, so, if you are able to attend, it's always nice to catch-up. Dates to be announced on our website and Facebook pages soon. In the meantime, we wish you all a very Happy New Year and we look forward to seeing you sometime in 2018. Merry Christmas and a Happy New Year from all the team at Precision Porsche. We would like to thank all our customers, old and new, for your support in 2017; it has been a great year. We met fantastic people, worked on great projects and truly stunning Porsches. We all have our favourite ones, from the 924 to the mighty impressive 991 GT3 RS. We have been extremely busy this year. The business is growing, so it is my pleasure to announce new members to the team. Helping in the service department is Andy, our new Service Adviser, a qualified technician with over 30 years in the motor industry and he is already a great asset to the company. We have been interviewing for an apprenticeship position over the summer and are very pleased to introduce Patrick, our new Apprentice Technician. He has a great attitude and passion for sports cars and Porsche, and I am sure he will have a great future with Precision. Finally, I would like to introduce Dan, our new detailer. He has been valeting cars for over 20 years and loves nothing more than to bring your car's paintwork back to life. He just cannot wait to jump on to the next car. Whilst the company is expanding, we will never lose sight of our attention to detail and the utmost respect for our customers and their wonderful cars. It is our privilege to work on such prestige vehicles. We strive hard to provide a personal and professional service and are always looking for ways that we can improve. We welcome your feedback, good or bad. 2018 will be an even busier year with many new customers venturing into Porsche ownership and we look forward to welcoming them to Precision. There will be our popular 'Cars 'n Coffee' meet in the spring, which will include free Porsche health-checks and a chance to meet the Precision team, so watch out for that. We also attend our local Porsche club 'meets' once a month, so, if you are able to attend, it's always nice to catch-up. Dates to be announced on our website and Facebook pages soon. In the meantime, we wish you all a very Happy Christmas and New Year. Stay safe on the roads and we look forward to seeing you in 2018. Get a grip. It's only a bit of snow. Many of your cars will be nestling under blankets in nice warm garages this Winter, but for those who use them throughout the year, don't forget your Winter tyres if the weather gets dodgy. Wide Summer tyres and temperatures below 7 degrees don't mix. It doesn't have to be snowy or icy, just cold. Summer tyres stiffen up when the temperature drops whereas Winters stay flexible and give you better braking and handling.